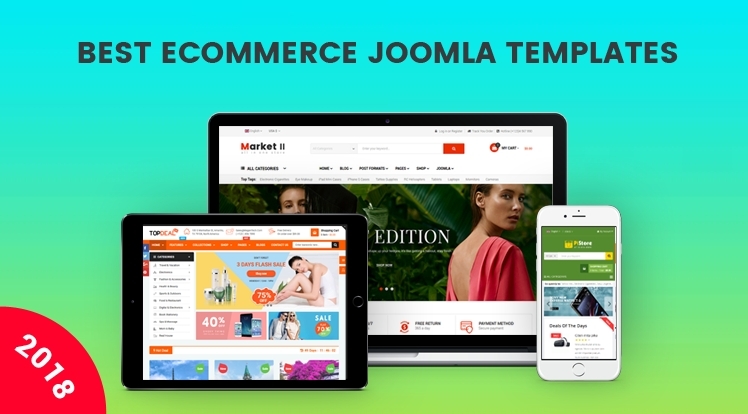 Sj Market II is a powerful, professional multipurpose eCommerce Joomla Responsive Template powered with VirtueMart 3 component that perfect for various kinds of online stores, eCommerce & business websites. With Sj Market II, you can quickly setp your online store just in minutes. Sj PiStore is a fresh and stunning premium responsive & multipurpose VirtueMart 3 template. With Sj PiStore, you can quickly create an intuitive eCommerce website without much coding knowledge. Sj PiStore is integrated with Powerful VirtueMart 3 Component which allows you freely show all your products in a clean way. Sj TopDeal is a multipurpose eCommerce Joomla template with clean & modern design. The deals, eCommerce template based on the flexible Helix 3 Framework that offers unlimited possibilities and customization configuration options.The responsive Joomla 3 template comes with JoomShopping component that allows you simply build and control your online store. It can be converted to any type of online store that you wish. SJ ShoppyStore is a stunning responsive Joomla template built with Bootstrap 3 and powered by VirtueMart component. The eCommerce Joomla template is ideal for any kind of shopping store from clothes to electronics stores.inspired for any retail online stores from fashion store to technology store. SJ ShoppyStore is available with 3 homepage layouts and 5 color variations that bring great options for using. SJ TheCool is an attractive responsive One Page Joomla template designed for those who want to sell books, magazines, other printed products online or build any blog, magazine and news portal websites. The bookstore Joomla template features 2 homepage layouts and animated content blocks with nice scrolling effect and beautiful color combination that bring it a clean and professional look. SJ Market - A premium responsive multipurpose Joomla template with VirtueMart 3 supported which perfectly adapts for any e-commerce website like: digital store, hitech store, watch store, fashion store, jewelry and accessories store… SJ Market supports 4 different homepage layouts which are easy to switch. SJ MegaShop - Multi-eCommerce Store with JoomShopping Component. SJ MegaShop is a responsive multi-purpose Joomla template that is promoted by JoomShopping component. It has everything you need for building any online store with wide range of products types, especially furniture store. Maxshop is a modern and clean coded multipurpose VirtueMart template that is designed for digital store, hitech store, watch store, fashion store,accessories or retail websites.Maxshop is built with VirtueMart 3 component and integrated with latest YT Shortcode version. Therefore, it comes with dozen of advanced features that make it really easy to use and customize. Besides, Maxshop supports 5 distinguish homepage layouts and 5 color variations for user choosing. They are not all the top eCommerce Joomla templates from SmartAddons. You can explore more design for building online shop here or browse for all professional Joomla templates for multipurpose now.